Germany’s white paper has added significance in a future EU without the UK. There are a number of issues which still need clarification before the Franco-German couple works hand-in-glove on defense. Major crises are driving this push for a revitalized European project and a strategically responsible Europe. However, defense and security cooperation has been hampered for years by the Big Three’s diverging strategic mindsets, with the United Kingdom’s historical rejection of an independent EU military force outside NATO, France’s tradition of strategic autonomy, and post-World War II Germany’s posture as a European economic power reluctant to use military force in global conflicts. With the UK – which has the largest military budget in Europe – heading for the exit, Germany and France are now relaunching closer European military cooperation. The challenge will be to define a project that combines France’s historical role in developing the EU’s defense with Germany’s new active role in shaping it. In the 2016 security white paper, Germany sees itself gradually assuming a larger defense role within the frameworks of NATO and the EU: “Germany is increasingly seen as a key player in Europe,” and is ready to “assume responsibility” and “help meet current and future security and humanitarian challenges,” the white paper notes. In summary, it states: “The country has a responsibility to actively help shape the world order.” This is a major shift for Germany, signaling a necessary normalization of the German strategic mindset to better match a changing international security environment. The combination of Russia’s resurgence, the spillover effects of the crises of the Middle East and North Africa into Europe (refugee flows, terrorism, Islamist radicalization, etc. ), and the Brexit vote are eroding the EU’s – and also the United States’ – capability to project soft and hard power, and changing the way Germans think about the challenges of the world around them. At the same time, the 2016 white paper can be read as a response to the concerns of Germany’s allies (notably the US and France, but also Poland), who have been nudging Germany to take on more political and military responsibilities. In fact, the white paper aims at showing that Germany has taken their concerns into account. Since the Libyan fiasco of 2011, when Germany abstained in the UN Security Council vote establishing a no-fly zone over Libya rather than voting with its allies, France has been seeking a change in the German position regarding deployment in multilateral formats. Berlin now recognizes that coalitions of the willing like the one fighting the so-called Islamic State in Syria and Iraq will only grow more numerous in the future. Germany also wishes to be considered a more attractive and reliable military partner – a partner capable of achieving objectives across the entire spectrum of military operations. Paris will closely follow the implementation of these advancements, keeping pressure on Berlin to significantly improve its force projection capabilities and deliver on the idea that the Bundeswehr should broaden its spectrum of capabilities and actions. The white paper also envisions a future European Security and Defense Union and the establishment of a permanent civil-military operational headquarters in the medium term. Shortcomings in the French- and UK-led 2011 Libyan air campaign and aging equipment used in African missions have convinced French officials of that necessity. France still sees strategic autonomy as critical, but wants to move ahead with ideas long blocked by Britain – for example a joint EU command headquarters and shared military assets. Germany is emerging as a clear leader in this field, and is showing that it means business when it comes to building up a more integrated European force with initiatives including Dutch-German defense cooperation, preparations for similar arrangements with Poland, and a proposal that, in the future, foreign EU nationals will be able to serve in the German armed forces. In the post-Brexit context, Germany is shaping up as the top nation France will turn to on defense matters. This new French-German configuration will most probably benefit Germany and partially weaken French leadership on defense matters. The French are of course reluctant to give Germany too much power when it comes to defense; historically, EU defense was a French concept which benefited from German support and British cooperation (which is quite wide-ranging, as the agreements of Saint-Malo and Lancaster House testify). These days Paris is more interested in a stronger EU defense policy than in the integrationist project per se, seeing the EU as a way to share the burden of counterterrorism and diminish dependence on the US. A European army could potentially jeopardize French strategic autonomy, though. Hard questions, like who will pay for an EU military headquarters, how it will be structured, who will be in command, and what the European army would be used for, still need to be addressed. The German project for European defense needs to be clarified and based on a French-German plan, with an inclusive approach vis-à-vis other EU member states like Italy, Poland, and other Central European countries. The idea put forward by the Weimar Triangle of an annual European Security Council where strategic issues relating to internal and external security would be addressed by EU leaders is a first, important, and easily-implementable step. In the short run, however, Germany will not be able to replace the UK as France’s closest military partner. The Franco-German couple combines a budgetarily weakened but internationally active France with an economically strong but strategically restrained Germany, and this can only change slowly, one step at a time. In addition, Paris and Berlin have different strategic cultures and priorities. France has a special sense of responsibility for global security and does not hesitate to act unilaterally if necessary. From a French perspective, it would be desirable for Germany to take over more responsibilities in areas where France is engaged, in particular in Africa and the Middle East. The French defense minister recently proposed that the EU should send military ships to ensure open waterways in the territorially disputed South China Sea, but Germany is not willing to initiate military operations yet, let alone in East Asia. 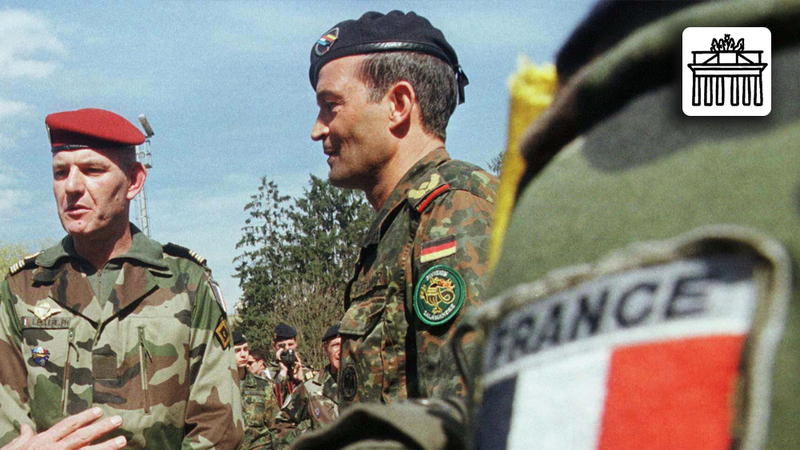 These differences may be an obstacle to French-German efforts to develop stronger EU defenses. Paradoxically, it currently seems easier for Berlin and Paris to agree on the central strategic importance of NATO for their defense. is Senior Transatlantic Fellow and Director of the German Marshall Fund’s (GMF) Paris office. She also leads the GMF’s Transatlantic Security Task Force.